Cauliflower takes the place of chicken in tacos at Nicole Marquis' Bar Bombon. At the restaurant, the cauliflower is battered and fried; home cooks can get similar results with an oven. A billion fried chicken wings, 28 million pounds of potato chips, 325 million gallons of beer. That's just some of the belly-busting grub on the menu when Americans hit the Barcaloungers on Sunday for Super Bowl LI, historically the second-largest food-coma-inducing day after Thanksgiving. But it doesn't have to be that way. Why not mix up your game this year and run offense against the same old same old fat and calorie-laden traditional snacks? We're not suggesting a day of fruits and berries -- nothing that radical. Instead, swap out fried, fatty options for big, bold flavors that won't land you on the sidelines. "I think there's a happy medium," says chef Dan Bethard, assistant director of culinary operations for Iron Hill Brewery & Restaurant, a craft beer and restaurant group with 12 locations throughout Greater Philadelphia and Delaware. "Just take the kinds of food we think of as not that healthy, like chicken wings, nachos, and dips and substitute different cooking techniques and ingredients to take out some of the fat and calories." Bethard, a huge Eagles fan who is rooting for the Patriots despite how they treated the Eagles in 2004, uses Buffalo wings as an example. Instead of fried wings in buttery Buffalo sauce dipped in fat-filled blue cheese dressing, Bethard bakes his wings after marinating them in a spicy jerk sauce powered with allspice, habañero pepper, and scallions. He swaps out the blue cheese dressing for a cooling mango dipping sauce, a pairing that is both addictive and lower in fat and calories. "I'd say steer away from frying," he says. A raw option like fresh guacamole, paired with "homemade" tortilla chips made by baking wedges of corn tortillas is an appealing alternative to typical chips and dip. Ceviche, raw oysters, and shrimp cocktail are three more ideas for slimming Super Bowl fare. As the co-founder of Foodstand, an app designed to help people build healthier eating habits, Rachna Govani of New Jersey has tested all kinds of veggie-centric recipes on her football-loving husband. Her strategy? Take the offense by subbing vegetables for meat- or starch-heavy recipes, like cauliflower buffalo "wings," broccoli "tots" instead of tater tots, sweet potato veggie nachos, and portobello sliders. "As long as your guests can snack while keeping their eye on the game, they'll happily indulge in a veggie-based bite," she says. She also uses a food processor to grind up mushrooms, legumes, and nuts to make a filling that can be used to make burgers, tots, poppers, or fritters—bite-size veggie-forward delights to please any crowd. Although he is a fan of decadent spreads that include Italian hoagies, barbecue ribs, and pigs in a blanket, Butcher Bar chef John Strain isn't afraid of mixing it up. "Using ground turkey in sloppy joes makes a big difference, and the flavor is just as good," he says. Take things a step greener by wrapping those Joes in leaves of lettuce instead of buns for a crunchy, satisfying alternative. Vegan since 2008, Elkins Park native Nicole Marquis owns HipCityVeg, Charlie was a sinner., and Bar Bombon, all plant-based eateries big on flavor. Marquis is passionate about the health benefits of a vegan diet after her father lost weight and conquered type 2 diabetes by changing his unhealthy eating habits. 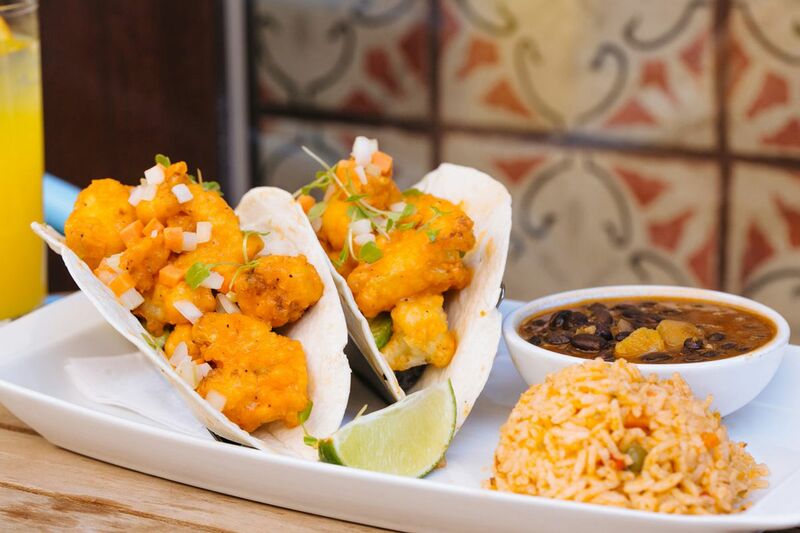 At Bar Bombon, her Rittenhouse Square Latin-inspired bar and restaurant, juicy Buffalo cauliflower takes the place of chicken in tacos brimming with crunch and umami. Although tempura-battered and fried in the restaurant, baking will achieve a similar satisfying crunch when preparing this recipe at home. In the 10 years he competed in men's physique contests, Mike Kneuer got so bored with eating chicken and broccoli he put together his own collection of high-protein, low-carb recipes. Published as the Shredded Chef Cookbook, these 120 gluten-, NGO- and soy-free recipes are designed to build muscle and keep you feeling full and satisfied. Grass-fed beef tacos, sautéed Asian shrimp, and pork burgers on a smashed plantain bun are a few of his faves. Kneuer, now a personal trainer and wellness director at a behavioral health facility in Florida, believes that not only is eating well good for the body, it's good for the mind. His next book, Great Food, Great Mood, will focus on recipes rich in omega 3s, fats that have been known to have positive effects on mental health. Eagles fanatic Melissa Reese, who works in King of Prussia and lives in the Lehigh Valley, will feed a gang of sports fans on Sunday. "My crock pot is my friend," she says. "I try to keep it simple." Although most of her crowd-pleasers aren't particularly low in fat, she is proud of an easy feta dip she whips up by the bucketful, a savory blend of olive oil, aromatics, and tangy sheep's milk cheese. Served with crudités and baked pita chips, this is a guilt-free nosh. If you're headed toward temptation Sunday, Medifast corporate dietician Alexandra Miller feels your pain. Miller advises eating something healthy before the party and drinking water in between each adult beverage to slow you down and keep you feeling full. If you do over-indulge, don't beat yourself up. "It's not about being 100 percent perfect" she says. "Only indulge in foods that are truly worth it, and skip anything that isn't. If you are going to have nachos or fries, skip the bun on your burger to save calories. Find ways to compromise."